I bought this little Anemone nemorosa at the post-meeting plant sale at the Adirondack Chapter of the North American Rock Garden Society in Ithaca, NY last Saturday. After doing a little research, and finding out it likes shade and woodsy soil, I planted it on the shady side of the house on Sunday evening. I didn’t realize the hot weather was expected to get even hotter (90+F!) the following day. I knew the little plant would wilt in the heat and wind, so I hunted up my cache of plastic, open-weaved berry baskets and covered the little anemone with a basket. 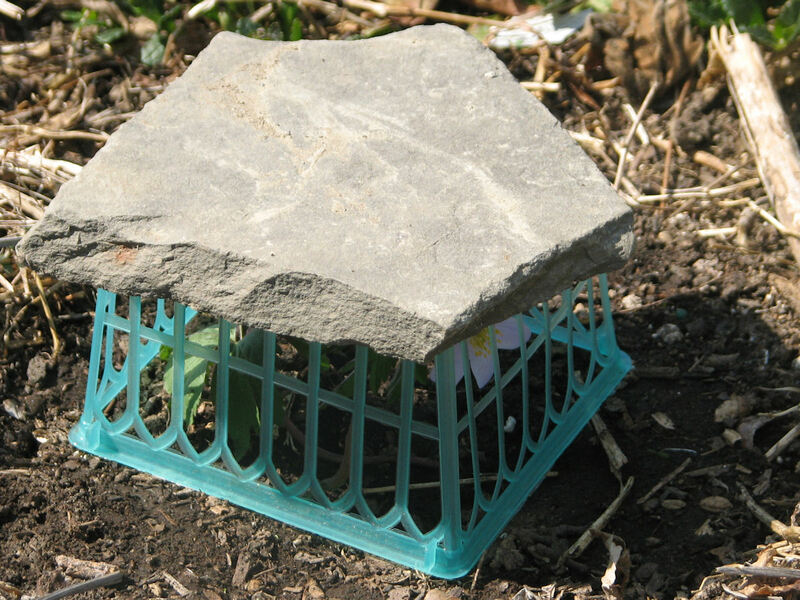 The rock keeps the basket from blowing away and provides additional shade. A simple, temporary device to help a transplant get acclimated. The heat wave is supposed to break this afternoon, and I will remove the rock and basket when cooler weather returns. These berry baskets are also great for protecting tender young plants from animal nibbles. Unfortunately they are not as common as they once were, and I zealously stockpile each one that comes into the house. Thanks for the ideas. I had empty flats from purchasing small plants and I put a stake in the ground and created a lean-type shield for my very unhappy sunflowers. But I ran out, so I used a sandwich board for advertising garage sales and some upside-down lawn chairs. Let’s hope it works. I think it’s too late to try again with sunflowers in the Pacific Northwest. I feel like a murderer… but the sun wasn’t supposed to come out today!!! Thanks for the berry box idea. I’m going to have to start hunting some down. I think they would be the perfect way to cage off baby plants from the band of marauding chickens I keep in my backyard. Great ideas. Wish I needed them in central IA. right now we’re chilly chilly chilly! Good idea with the basket, Kathy. Sounds like a neat plant, too. We have the native Anemone canadensisgrowing over by the creek. It won’t flower until around the first of June. Your method with the basket reminds me of what I have to do with my cabbage and other cole crop transplants on a sunny, hot day. On a larger, i.e., when I have a lot of transplants in the garden, I lightly cover each one with straw. Thanks for the ideas on providing shade. We have had great weather for the transplants, but the goldenrod I moved wilted, so I cut it back. I should give it some shade, too. I’ve done the chair trick before. Also have used large pots set beside the plant. It looks unsightly for a few days, but it definitely helps the plants settle in. You guys are hotter than Austin right now. I love your “chair-shade.” I used a small plastic clothes drier with a sheet thrown over it. Since we are so dry here in So. Cal. I sprayed the sheet with the hose for some mid-day humidity for my new lettuce plants. Kathy, like Elizabeth, I’ve used plastic laundry baskets as temporary covers … also cardboard boxes with holes punched in them, small branches/trimmings, even overturned trash cans if nothing else is available! That poor little anemone looks like it’s suffering the brutal sun at camp x-ray in Guantanamo. I hope you’re waterboarding him often in the heat. 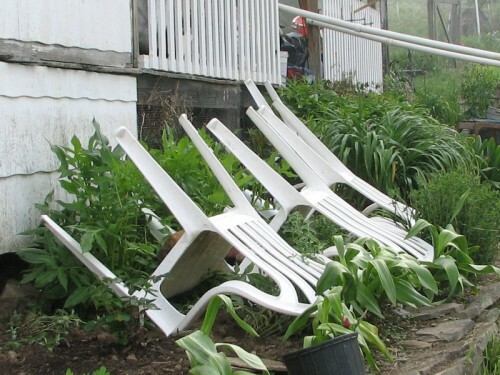 Jim’s last blog post..Espalier emergency. Maybe you can help. Kathy, Good idea.. I did buy about 24 pieces of rebar…they come in various lengths and constructed my own shade covering system for bigger areas…Old Sheets clothes pinned to the rebar drapes nicely over a bed. Funny, but until this past weekend, I never needed to protect seedlings from heat. I like the produce basket idea. There are six of those in my trash right now, but I may liberate them before they get out to the curb. Thanks for the tip. I love the idea of using the upside down lawn chairs – especially since they always seem to be nearby. I have also used old laundry baskets when I have just a few transplants to protect. Elizabeth’s last blog post..How do you know if you’re an artist? What a cute little anemone and great ideas on creating shade in an emergency.